Caffeine is a common ingredient found in energy drinks and many other foods and beverages. Caffeine has been safely consumed, in many forms, for thousands of years. Caffeine is one of the most studied ingredients in the food supply, 85 percent of Americans drink caffeine on a daily basis. Regardless of whether caffeine is added to a product (such as in energy drinks) or naturally occurring (such as in coffee or chocolate), and whether it is consumed hot or cold - or slowly or rapidly, there is no chemical difference between the two. In fact, the effects are identical. This means that drinking an energy drink would have the same effect on caffeine blood levels, and the same physiological effects, as drinking coffee with comparable levels of caffeine. Global consumption data has repeatedly shown that about 90 percent of consumers’ caffeine intake comes from other beverages – such as coffee, tea and soft drinks, with the largest portion coming from coffee. Despite the popularity of energy drinks, overall caffeine intake has not increased since they entered the market. Like many beverages, energy drinks are sold in a range of package sizes. Regardless of the size, most mainstream energy drinks have a caffeine concentration of about 10 mg/fl oz, which is comparable to a cup of home-brewed coffee. Thus, typical 8 fl oz, 12 fl oz and 16 fl oz cans of energy drinks contain 80 mg, 120 mg and 160 mg of caffeine, respectively. In fact, most mainstream, energy drinks contain about half the caffeine of a similar-sized cup of coffeehouse coffee you’d find at the corner coffeeshop. 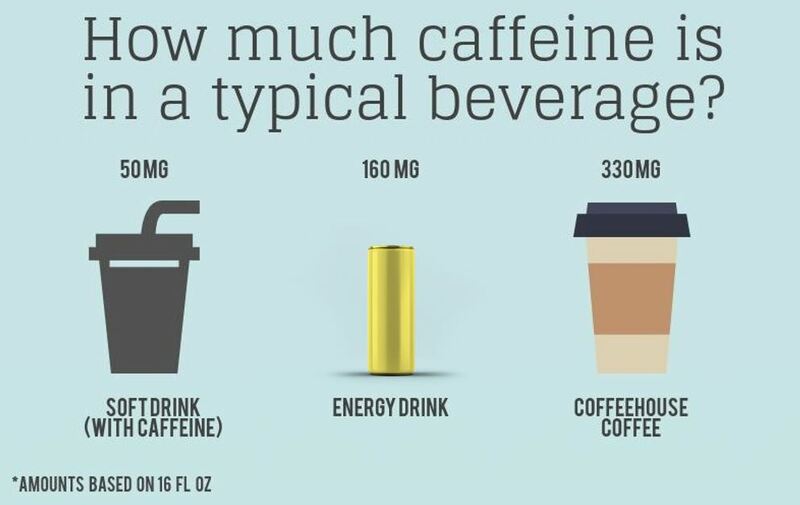 For example, a 16 ounce energy drink typically contains about 160 mg of caffeine while the same size coffeehouse coffee contains about 330 mg.
Visit the resources section for more information.